Very attractive comfortable apartment facing south and east with beautiful views of the surrounding mountains. The residence 'Les Jardins Alpins' was built as recently as 1994 in a luxurious, but traditional style and our apartment has only just become available for letting, having been used only for the family's holidays. It is situated in a quiet residential area of St. Gervais, ideally situated close to the telecabin lift, which is literally 2 minutes walk away, but not seen from the apartment. The village centre with its shops and restaurants is only a short 10 minutes walk away. The apartment is in superb 'as new' condition and is tastefully pine clad, giving a chalet appearance internally. It has 36.5 sq. metres of accommodation and most of the furniture is in matching pine of high quality. It has two bedrooms with a double bed in one bedroom and a convertible single bed that slides open as a double bed in the other bedroom. There is also a collapsible baby's cot and baby bath. The lounge/dining room, which leads out onto the balcony, has a sofa, dining table and chairs for up to 4 people, a colour television, DVD player and radio and Wi-fi access to the Internet. Part of the lounge and one of the bedrooms has a pine clad sloping ceiling with wooden beams making it very attractive and creates a chalet style interior appearance. The kitchen area is very well equipped with electric hobs, electric oven, dish washer, washing machine, toaster, kettle, coffee machine, plenty of matching crockery, cutlery and glasses. Area Description:: The whole area has so much to offer with the widest range of activities imaginable in both summer and winter, for the young and the 'not so young'. The wooded mountains and views are magnificent and are an absolute paradise for skiers or mountain walkers. While you explore or ski, young children can be looked after at the crèche or kindergarten at Le Bettex, where there are also activity clubs for older children. In summer you can walk for miles on marked paths, in meadows or high altitude, including the well loved 'balcony walks' along the Chamonix valley. Megève, the beautiful town well known to the rich and famous, can be easily reached by car within about 10 minutes, or more leisurely with spectacular views via the very efficient mountain lift system. Chamonix, immediately at the foot of Mont Blanc (4807m), can be reached by car within 25-30 minutes and a visit by cable car up to the Aiguille du Midi (3804m high) near the summit of Mont Blanc is absolutely breathtaking. Seasonal Activities:: WINTER: ski, snowboarding, cross-country skiing, tobogganing, snow shoe walking (snow hikes over special routes), snow park (for special snow activities), ski entertainment area for young children, crèche facility & kindergarten at Le Bettex (next village up the mountain from St. Gervais). SUMMER: tennis, walking, fishing, horse riding, golf (also championship courses at Megève and Chamonix), mini-golf, cycling, mountain biking on marked trails, canoeing, white water rafting, canyoning, kayaking, rock climbing, hot-air ballooning (discovery flight), water sports lake with beach (20 mins), summer tobogganing at Megève and Chamonix, summer skiing on Mont Blanc. SUMMER & WINTER: ice-skating, ice dancing & ice hockey (Olympic ice rink), indoor & outdoor swimming, paragliding, hang-gliding, thermal baths, mountain railway (St. Gervais to Mont Blanc), activity clubs for children (Le Bettex), sports centre (Megève), mountaineering at Chamonix (with professional guide). Mountaineering:: The 4810m summit of Mont Blanc rises on the communal territory of Saint Gervais. From the resort, mountaineers can follow the famous 'Voie Royale' to Mont Blanc, conquered in 1855 by an Englishman named Hudson. Start with an excursion on the Mont Blanc Tramway before walking towards the Tête Rousse mountain refuge and a stop over near the 'Aiguille de Goûter'. Climb the 'Dôme du Goûter' towards the Vallot mountain refuge and the final ridge to the summit at 4810 metres. It is advisable to hire one of the experienced professional mountain guides, who have offices at St. Gervais. The Shower Room Includes a Wash Basin with Illuminated Mirror above and storage cupboard. We provide blankets, pillows, mattress and pillow protectors, but sheets, pillowcases and towels are not included. However, they can be hired and arranged by us through our local agent. Exterior parking adjacent to the residence. Garage situated in the basement of the residence. Wi-fi access within the apartment. The long balcony faces south-east and has excellent views of the surrounding mountains. It has a plastic dining table with 4 chairs for eating outside. The apartment is on the 4th floor accessed by an efficient lift or stairs. 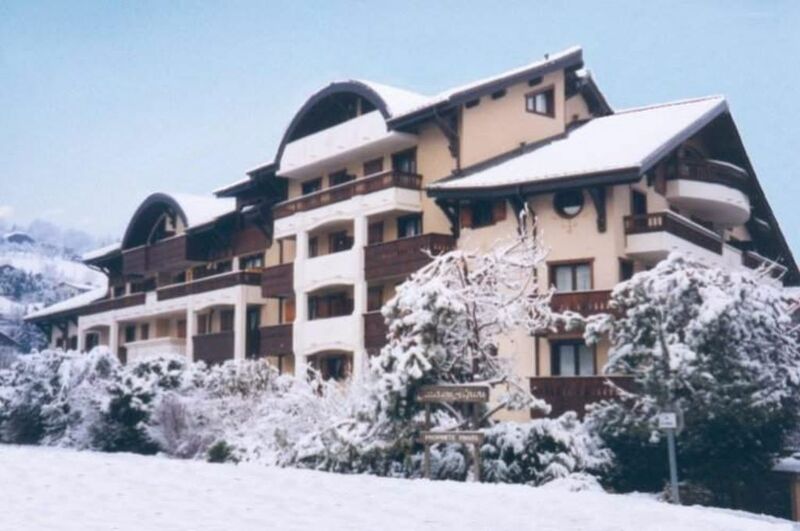 It is situated very close to the telecabine lift (2-3 mins walk) and very convenient for skiers. There are two bedrooms and a fully equipped kitchen area. Electric heating, hot water and use of the basement garage & ski locker room are all included in the rental. Cleaning equipment is provided, including vacuum cleaner, ironing board with iron, brushes, mops etc. just in case you might need them!! The large sheltered balcony has a table & chairs and faces south-east with excellent views of the Mont Blanc mountain range. Blankets, pillows and mattress protectors are supplied. Bed linen (sheets, pillow cases and towels) are not provided, but can be hired at very reasonable rates from our local agents in St. Gervais and we would be pleased to book them for you if you are not able to bring your own. Non-smoking apartment. This is a lovely little apartment, perfectly situated close to the main Bettex telecabin. Also very handy for a bakers across the road and an easy stroll into St Gervais itself. The apartment is clean, warm and cosy and a lovely haven to return to after a day in the mountains. Loads of hot water too. Would love to return and have no hesitation in recommending. Owner was very helpful throughout booking process. Absolutely brilliant apartment. Perfect acommodation for family with two young boys. Very warm, well equiped, lovely balcony and hot powerful shower. Best possible location for any budget skiers. Next to ski chair but close enough to supermarket to self cater without a hire car. superb customer service and knowledgeable / flexible local agent. We will be back! I'm very grateful to Jo for such a positive review and very pleased that they enjoyed all the facilities of our apartment and the local area. Their kind comments are very much appreciated and look forward to their return visit. We had a lovely skiing holiday staying at this great appartment. The appartment was very well equipped and extremely comfortable. Very close to the main lift and there was a great bakery accross the road. The town was an easy walk where there was every shop you could want with good supermarkets and a good tourist information centre. A great little apartment. Within walking distance of the town and staggering distance of the ski lift wearing boots. Small but very well equipped, warm and clean. Great support from the local agent and from Brian the owner. The underground garage is really convenient. Fresh bread and ski hire just across the road. Hope to go there again. We had a very enjoyable stay in the apartment. It was very good value considering there were 2 bedrooms. The apartment is on the top floor so although it is small, the high ceilings give it a feeling of space. It was very clean and well equipped and we used the balcony overlooking the mountains for most of our meals. The 'best baker in town' was also just over the road, but we found the local restaurants very pricey - partly due to how low sterling is now! Even though all the local lifts had closed for the season we got around easily. The highlights were walks from Les Contamines and the cable car in Chamonix to Aiguille Du Midi. Saint-Gervais-les-Bains is situated in the French Alps, Haute-Savoie region, 70kms from Geneva, 24kms from Chamonix, 11kms from Megève, 10kms from Sallanches and 4kms from Le Fayet. SNCF trains operate to Le Fayet station. TGV runs direct from Paris to Le Fayet at weekends during high season. Car hire is available at Le Fayet station and Geneva Airport (prior booking recommended). Golf: There are championship courses at Megève, only 15 mins (11kms) by car from St. Gervais and also at Chamonix about 30 mins (24kms) away. Mini-golf is also available at St. Gervais. Ski: The skiing area is integrated into the Megève domain with 360kms of pistes and over 100 lifts and is ideal for mixed ability groups. The pistes themselves vary from pretty tree-lined runs amongst the evergreen forests to large open areas, catering for skiers of all standards, beginners, intermediates and the really advanced. There are snowmaking machines on many runs during the winter for guaranteed skiing. Some areas are specifically allocated for snowboarding and there are large areas for safe off-piste skiing. The mountains included in the lift pass are Mont d'Arbois (1833m), Mont Joux (1958m), Mont Joly (2525m), Rochebrune (1754m), Cote 2000 (2014m) and Jaillet (1757m).